Bigfoot's test results put a damper on what was seen as one of the most exciting fights of the year. Marc Ratner was the head of combat sports’ most influential commission for nearly 15 years, yet he had never dealt with a situation like the one that reached his desk earlier this week. 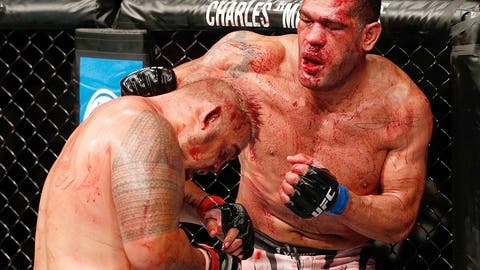 Antonio "Bigfoot" Silva had failed his drug test. A suspension and stripping him of his bonus money were givens. But what about the result of the fight? In the case of a winner testing positive, it is routinely changed to a no contest. But when a loser tests positive, the result stays the same. So what to do when it’s a draw, as Silva’s UFC Fight Night bout with Mark Hunt had been? It was hardly an easy decision for Ratner, the UFC’s vice president of regulatory affairs who ran the show in lieu of a government regulatory body. He thought about it. He spoke to other regulatory officials around the country. He discussed it with UFC executives Dana White and Lorenzo Fertitta. And finally, he split his ruling. Silva would get a no contest, but Hunt would keep the draw. "I think a draw is better on your record than a no contest," Ratner told FOX Sports. "That’s my feeling. I’m sure there will be a lot of people who disagree with me on this, but I didn’t want to penalize Mark Hunt." Ratner said he could not recall any similar instance during his long tenure as the Nevada state athletic commission executive director. However, there was at least one boxing match in Nevada that mirrored it. In November 2006, just months after Ratner left the post for the UFC, Omar Nino Romero and Brian Viloria fought to a majority draw. Following the fight, however, Romero failed a post-fight drug test. After a NSAC meeting, the bout was declared a no contest for both of them. Ratner was not aware of that ruling, but felt the decision he came to was the most just of all of the available options. "It’s very unusual," Ratner said. "It might be unprecedented to do this but it seems like the right thing to do. I just found there was an inherent unfairness to penalize Hunt. That’s the way I looked at it. But we also can’t award a win. That would be wrong." Ratner said he has turned in his decision to MMA’s official record keeper and doesn’t anticipate any objection.